EVO Collaborator for Outlook, which is an Outlook add-in that launches when we open Outlook. 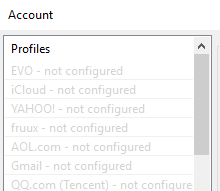 Configure Profile(s) – We can click on this button to open up a window where we can add/edit/delete profiles. Profiles – Each profile entry contains settings and parameters associated with a particular cloud or on-premises services. The first 20+ profile entries are dedicated to some popular services on the market. Click on an entry of Profile ## – non-configured to cater a user-defined profile. Hostname, Full e-mail address, Password – These 3 fields are usually required unless otherwise specified. It is recommended to enter full e-mail address rather than username only. Enabled – This box is checked by default to enable this profile. Read-only – By checking this box, all contents synchronized from the server are in read-only mode. Any change you make on Outlook will not be synchronized back to the server on the cloud. Disable alerts – Check this box to disable any Reminder alert initiated by any non-primary profile that belongs to other users. For example, when user A synchronizes user B’s CardDAV and CalDAV data, any of user B’s Reminder alerts should not pop up since they do not belong to user A. Disable birthday – Check this box to disable any birthday alert initiated by any non-primary profile that belongs to other users. 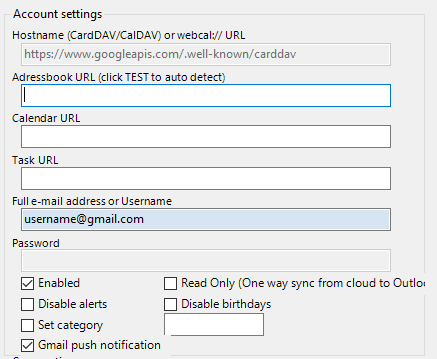 For example, when user A synchronizes user B’s CardDAV and CalDAV data, any of user B’s Birthday alerts should not pop up since they do not belong to user A. Set category – This feature enables you to define your profile into a newly created or existing category. Gmail push notification – When a configured Gmail account in Outlook matches the Gmail account configured in EVO Collaborator for Outlook, this Gmail push notification will be enabled by default. It will make noise notification when your Gmail has new mail arrival. This option will only appear when Gmail profile is selected. Sync options – In spaces under each line, you can name folder containers that store your contacts, calendars and tasks. Or, you may specify folders and their locations by clicking on folder icons to the right. Reset – This button will forget all configuration of selected profile. TEST – This button will contact server or service and authenticate account validity. Apply – This button will save configuration. Quit – This button will quit and close Account window. Synchronize – Click on this button to override countdown counter and initiate a synchronization. Sync contacts – Check this box to enable contact synchronization. Sync calendars & tasks – Check this box to enable calendar & task synchronization. Interval – Select a time interval for an automated synchronization to take place. Explore server – List all profiles, their contacts and source codes as well as C2C Clout to Cloud Copy feature. Full name – Once you click on a profile from list to the left, a list of contact entries on the server will be displayed. Detail – Once you click on any contact entry on the list in the middle column, you will see detail of the contact entry. vObject source code -Once you click on any contact entry on the list in the middle-column and click on vObject source code tab, you will see vCard source code of the contact entry. The source code can also provide a reference for EVO stuff to troubleshoot for you. C2C Cloud to Cloud Copy – Click on this button to duplicate selected contact entries to another configured profile on-the-fly. Unlink – This function is not available under Explore server window. Delete – Click on this button to delete selected contact entries from the server where the profile belongs to. Download – Click on this button to download selected contact entries from the server to the designated folder where the profile is assigned to. Browse local – List all profiles, their contacts and source code in local Outlook as well as O2C Outlook to Cloud Copy feature. Profiles – Listing all profiles you have defined in Configure Profile(s). Full name – Once you click on a profile from list to the left, a list of contact entries on local Outlook will be displayed. Detail – Once you click on any contact entry on the list in the middle column, you will see detail of the entry. vObject source code -Once you click on any contact entry on the list in the middle-column and click on vObject source code tab, you will see vCard source code of the entry. The source code can also provide a reference for EVO stuff to troubleshoot for you. O2C Cloud to Cloud Copy – Click on this button to duplicate selected contact entries from local Outlook to the server where the currently selected profile is synchronizing with. Unlink – Click on this button to disengage selected contact entries from the server where the profile belongs to. Download – This function is not available under Browse local window. Explore server – List all profiles, their calendars & tasks and source codes as well as C2C Clout to Cloud Copy feature. Appointments & Tasks radial – Click on either Appointments or Tasks radial to view the respective entries. Full name – Once you click on a profile from list to the left, a list of calendar or task entries on the server will be displayed. Detail – Once you click on any calendar or task entry on the list in the middle column, you will see detail of the entry. vObject source code -Once you click on any calendar or task entry on the list in the middle-column and click on vObject source code tab, you will see vObject source code of the entry. The source code can also provide a reference for EVO stuff to troubleshoot for you. C2C Cloud to Cloud Copy – Click on this button to duplicate selected calendar or task entries to another configured profile on-the-fly. Delete – Click on this button to delete selected calendar or task entries from the server where the profile belongs to. Download – Click on this button to download selected calendar or task entries from the server to the designated folder where the profile is assigned to. Browse local – List all profiles, their calendars & tasks and source code in local Outlook as well as O2C Outlook to Cloud Copy feature. Full name – Once you click on a profile from list to the left, a list of calendar or task entries on local Outlook will be displayed. O2C Cloud to Cloud Copy – Click on this button to duplicate selected calendar or task entries from local Outlook to the server where the currently selected profile is synchronizing with. Unlink – Click on this button to disengage selected calendar or task entries from the server where the profile belongs to. Official website link – Click this button to visit EVO’s official website to find out additional related information. User interface language selection – Click this pull-down list to select preferred display language for user interface. 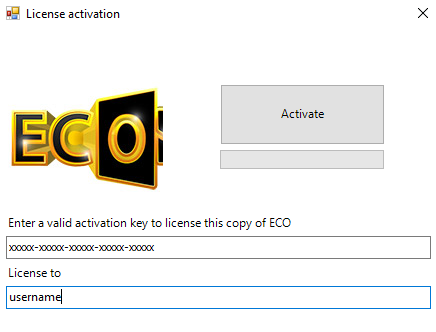 Team edition / Trial period end date – Before EVO Collaborator for Outlook is activated, click on Trial period end date to open a window where you fill up license key and registrant’s name. Once activated, click on Team edition to self-deactivate the license before migrating the license key to other computer.